Photos: Cake Gumshoe SetiaCakeSpy Note: This is a guest post from Cake Gumshoe Setia, who just started blogging at cakesbysetia.blogspot.com. I love cake. 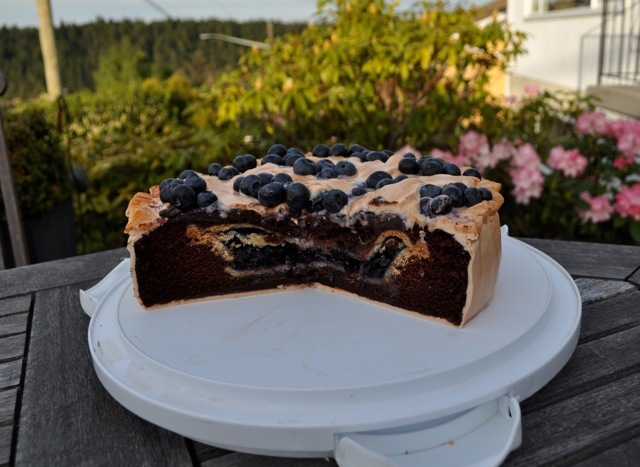 I bake cakes for many people and many occassions, and am constantly brainstorming my next cake project and an occassion to make it for. So, imagine my surprise when I happily tell my husband that I have a wonderful cake idea in store for his birthday, and he responds "I was actually thinking I might want pie". (Insert gasp of horror here). Pie? Seriously? You are asking a lover of cakes - a cake-artist-in-the-making, if I may be so bold, to make you a PIE? Don't get me wrong, I have nothing against pie. 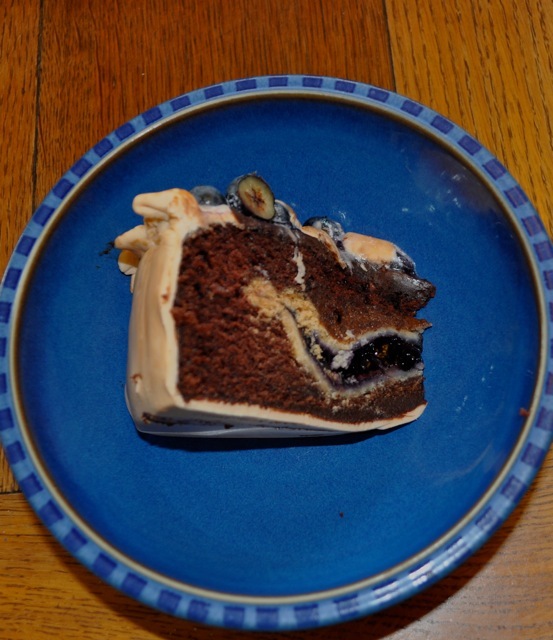 In fact, on occassion, I quiet fancy a slice; heated, served with a side of vanilla ice cream. I can even make a decent pie when I put my mind to it. Yet that is not the point, is it? The point, if not already apparent, was that I was desperately excited to come up with some wonderful cake creation for my husband's birthday. Sure, I knew he was probably teasing about the whole pie thing...right? However, I was now bound and determined to make something a bit tongue-in-cheek that would teach him a lesson, and yet give him what he wanted at the same time. My husband loves blueberries; fresh blueberries, blueberry pancakes, blueberries on cereal, and yes, of course, blueberry pie. And what goes swimmingly with blueberries - or any kind of berry for that matter, I asked myself? Why, chocolate of course! And so, I went forth and baked...And the results, in my opinion, were both pleasing to the eye and to the palate! Voila! 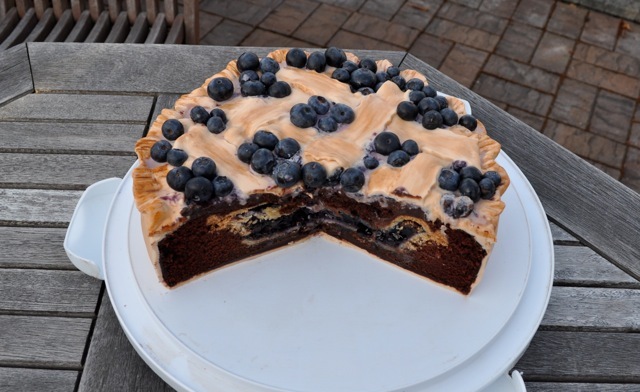 A deep-dish blueberry-looking pie! 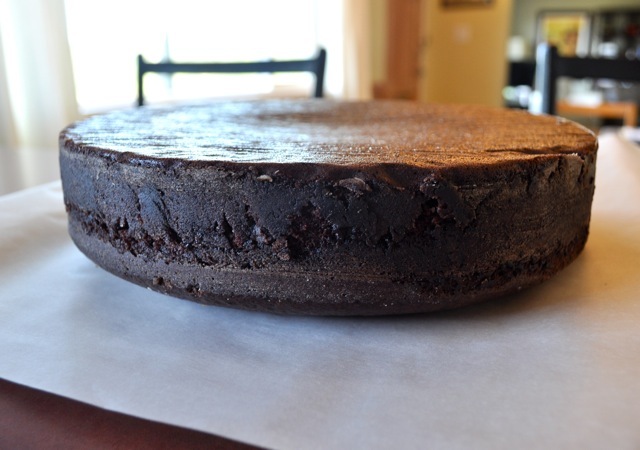 Make favorite never-fail chocolate cake recipe. Pour enough batter into the cake pan to just cover the bottom. Pour remaining batter on top and around sides of pie. Bake the cake/pie as directed- takes considerably longer than regular cake-baking time. It seems like the top will never cook, but be patient, it will! Just keep watching it! Turn pie over onto work surface so it is upside down. Smother with a delicious chocolate ganache. Smooth ganache with hot knife to ready it for the fondant. Decorate to look like a deep-dish pie, using fondant. 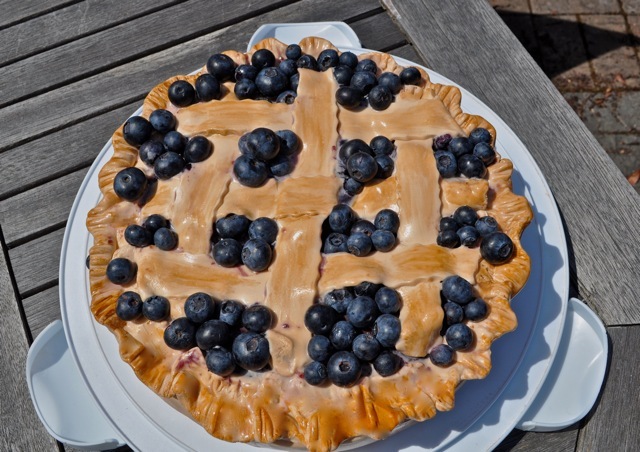 (I decided to do a lattice "crust" on the top). Use a little brown food colouring and vodka mixed together to 'paint' more colour onto the fondant, giving it a more "baked" look. Add fresh blueberries as desired.